I appreciate your work and would like to use a texture in one of my followers mod to be released here on Nexus. I kindly ask for your permission. Credit will certainly be granted to you. Welcome to the modding community! Unfortunately, you do have to install these files manually. After extracting, go to this directory: C:\Program Files (x86)\Steam\steamapps\common\skyrim\Data (note: sometimes, the files may not be on C drive but this is where you will find them most commonly) and paste the files there. Then, create a backup folder and go to ...Data\textures\actors\character and move the files it says to delete into that folder. Make sure you don't have that folder inside your Skyrim files. You don't need to do it manually. :) ..You can use NMM, that's much easier. 1: Download the look you want from "Main Files" .. Click the "MOD MANAGER DOWNLOAD" button, then NMM will catch it and download. 2: If you use an UNP body-type, then also click the "seamless UNP and Coverwomen (look number matching your choice)", and install after the first file. Are the "look" 1-5 images in the description tab broken for anyone else? This would be a good mod if the textures were fixed. I have tried this mod alone and with 6 different skin mods, all with the same results. Caucasian body, African-American face. I am not talking about grey-face bug, this mod just has bad texture shading. I even tried the overlays another author created to no avail. If I am missing something, or if anyone knows a skin mod this actually works with, please let me know. It makes me wonder, did the author even check his work before posting? This is blatantly obvious. It is an old mod that has not been kept up to date with the current skin textures. When the game came out this was a fantastic mod with what we had at the time. 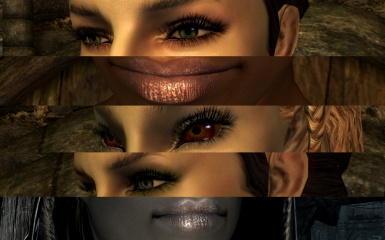 I would love a gloss lipstick effect for the newer body/skin mods, and yes using this mod caused issues for me also which is why I don't use it anymore. 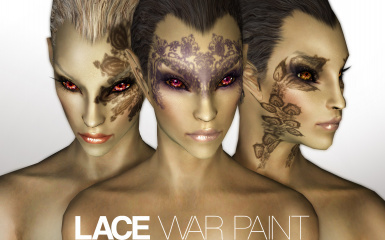 Each has a different makeup (lipstick/eyeshadow) style. Nice. Anyway it was all clearly explained on the images section. Not necessarily, Kenrox...some people might need help understanding which is which. Two posts down from this one someone asked, and others have asked here as well, so it is not an irrelevant post. Unlike yours. As with all mrLenski's mods, this is well done, and lends a beautiful effect to my character. I assume they have moved on, but my appreciation and gratitude go out to mrLenski just the same. Many thanks, nicely done. This mod looks freaking awesome! But I have a question about it... 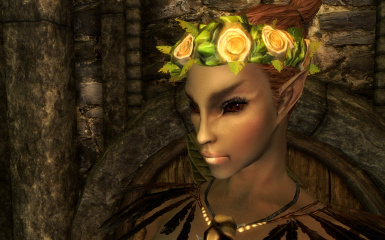 It creates any conflict with mods that works with female character's faces like the Bijin or Pure Girls ones? And.. It is compatible with SG Female Textures Renewal? (in order to avoid blend necks) Just asking! 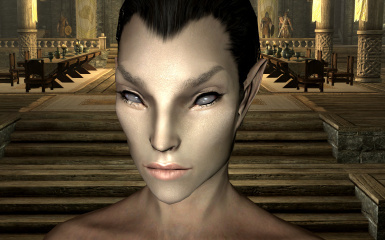 I love your coverwomen, and I would like to include it in an upcoming mod for SSE - please contact me!! i really like the pictures but how the hell do i get the right file when there are no descriptions other than look 1, look 2 etc please add descriptions so i know which file to download?